Here on the northern Great Plains, we are increasingly considering what the Dakota Wars from 150 years ago meant then and what it means today. 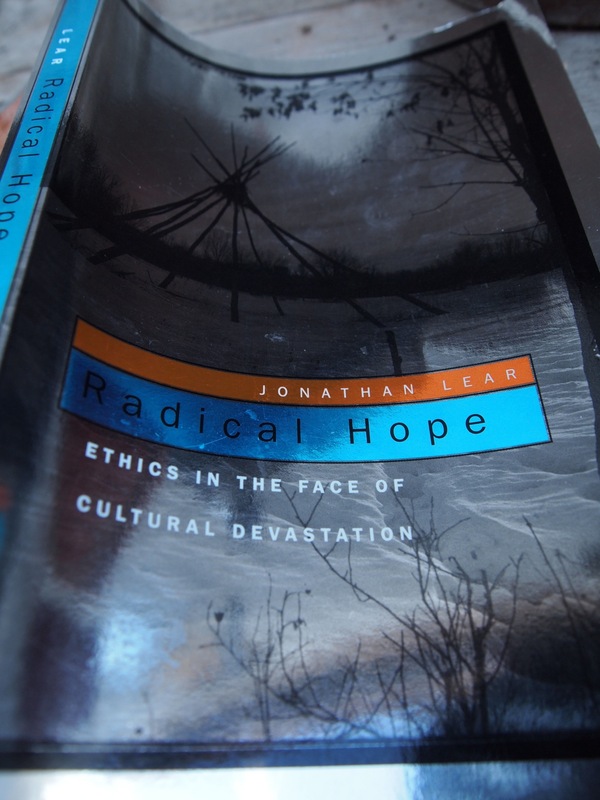 A piece of scholarship I stumbled across while visiting the bookstore of Pompey’s Pillar in eastern Montana (where, famously, an Anglo-American incised his graffiti on some tall rock) is Jonathan Lear, Radical Hope: Ethics in the Face of Cultural Devastation (Harvard University Press, 2006). Lear uses the historical documents from Plenty Coups, a Crow leader who helped his people navigate the turn of the 19th century. What makes Lear’s monograph interesting is how he uses his training in philosophy and ethics to approach a previously unexplored topic of the Crow. The rearrangement of this way of life came to an end due to the advanced encroachment of Euro-Americans who, among other things, obliterated the bison food source of the Plains indigenes. Lear doesn’t just stop with the known history of how the bison were wiped out, though. Instead, he expands and explains how the bison food source was a serious component of the Crow’s cultural and ethical telos. Bison had been incorporated into nearly every element of the Crow way of life, and Lear gives excellent examples by unpacking phrases that Crow used for dinner. For example, Lear notes that there was no such thing as simply cooking a meal. Instead, the cooking of a meal had a greater social-psychology behind it. The phrase cooking and eating dinner was inextricably bound to “the cooking-of-a-meal-so-that-those-who-ate-it-would-be-healthy-to-hunt-and-fight.” (Lear, 2006: 40) See how the telos — the psychological extension of an immediate act providing a base for the future — is connected to the food, and that the food comes largely from the bison? Yes, of course. And so when Euro-Americans — whether Sully at Whitestone Hill, or Euro-American riflemen — obliterated the bison, it struck not only at that food source, but at the very culture of Plains indigenes. In short, read this book. Today, December 26, 2012, marks the 150th year since the largest mass execution in United States history took place in Mankato, Minnesota. This execution has been remembered and suppressed for a variety of reasons, but it seemed reasonable to post and pass on at least two pieces of public history. The first is a story put together by This American Life, entitled, “Little War on the Prairie.” Here is a link to the transcript, and another link to the recorded radio program here. It aired on November 23, 2012, and I first heard it while driving back to Fargo from having Thanksgiving in Bismarck and Valley City. Photo by David Joles of the Associated Press. What is often missing from stories such as these is a kind of non-discussion about what followed this hanging. For example, it wasn’t just as though the hanging happened, and Governor Ramsey clapped his hands together and said, “Well, that’s taken care of…” Instead, it marked the beginning of annual punitive campaigns that the United States Government launched against the Sioux — against every combatant and non-combatant, or every man, woman, elder and child — throughout Dakota Territory. When we look back on it, the 19th century kind of looks like a racist primer for the industrial genocide that characterized much of the 20th century, at least the first half. The world eventually had a post-WWII convention to consider all of this. It’s sobering to think about. In the 1860s, Total War campaigns against the Sioux were organized by General John Pope, and he in turn charged generals Henry Sibley and Alfred Sully with carrying them out. Today there are namesakes of “Sibley” and “Sully” scattered all throughout North Dakota. These names were ascribed to the landscape, and they resulted from that earlier US-Dakota War that roared up and down the Minnesota River Valley in August-September of 1862. Below is another piece of public history called “Dakota 38 [+2].” It is excellent, and the documentary was put together in 2008. This year’s riders are just getting to Mankato, as they do every year. Here is another piece on this from the Mankato Free Press. This evening while toying around with Google Earth’s image overlay feature, I thought it would be interesting to see what a 2012 map would look like in contrast to the map of the 1860s in Mark Diedrich’s, Mni Wakan Oyate (Spirit Lake Nation): A History of Sisituwan, Wahpeton, Pabaksa, and Other Dakota That Settled at Spirit Lake, North Dakota (Fort Totten, North Dakota: Cankdeska Cikana Community College Publishing, 2007). I was keeping in mind how we — the Royal We — are all born into particular sets of cultural values that we consciously or unconsciously bring to bear on everything we process, do, and see. So in 2012, it’s a given that we can hop Eisenhower’s Interstate 94, lean heavy on the gas peddle, and within 1 to a dozen hours find ourselves anywhere between Minneapolis, Minnesota, Billings, Montana, Omaha, Nebraska, or Winnipeg, Manitoba. In 1862, the reality would have required weeks worth of time to cover that amount of space. One hundred fifty years is quite the temporal gap. But Google Earth reconnects us with the spatial, or what we might consider as that sense of place. Here, for example, is the Diedrich map imported into Google Earth with an approximate transparency of 20-40%. This is laid on top of a 2012 map (some specifics don’t quite line up, but considering that this took 3 minutes to put together, it’s not bad, and the general idea is conveyed). Note the non-existence of the 2012 place names. We get the large type of Dakota in the east, Nakota in central Dakota Territory, and the Lakota primarily west of the Missouri River. Imbedded within that are several sub-national sets, including the Ihanktuwana, Sisituwan, Pabaksa, Assiniboin, Mandan (“Gros Ventre”), Arikara, and Blackfeet Lakota. It might be worthwhile to filter our 2012 mindsets through an 1862 landscape in the same way that we would consider today’s landscape in Central Asia, western Europe, or eastern Asia. To an outsider, “it all looks the same.” But try telling someone who hails from Hong Kong that Bangkok and Ulaanbaatar are just the same. Or try telling someone from Tashkent that they’ve experienced something similar because they once saw a picture of Moscow, they talked to a guy who visited Kabul, or they heard about the cultural mecca of St. Petersburg. Or try telling a Parisian that Germany is just like Italy. Or try… yes, the idea is conveyed. And this doesn’t even begin to touch on the dynamics of Africa, Australia and so on. Above, the 49th parallel is quite pronounced, as is our national (or international) system of highways and byways. Today’s 2012 I-94 blasts east-west through former Native America. You can travel from Minneapolis through the 1860s Dakota (Red River Valley now), Nakota, Mandan, Hidatsa, Arikara (upper Missouri River) and Lakota country (now the Bakken Oil Fields) to Billings in about 20 hours (I cannot recommend any more efficient time). In North Dakota, we can sail past these 1862 landscapes at no less than 75 miles an hour, thermostat pumped full tilt, iPods routed through the speakers. This is the push and the pull between culture and landscape throughout time. I think that’s all I have for now. North Dakota Smoke Free announcement retrieved from the mail box on December 5, 2012. This evening from my post office box I retrieved several envelopes, one of which was the “SmokeFree!” announcement to inform North Dakotans of the latest smoke free Century Code 23-12-9 to 23-12-12. This got me thinking about tobacco in both a local and global historical context. Tobacco as a cash crop is one of the reasons Great Britain continued colonizing Virginia, and tobacco was cultivated by Native America long before the Columbian Exchange. As for a local historical context, tobacco appears in a variety of sources. One of them is through Guy Gibbon’s thorough work on the Sioux. Gibbon indexed the word “tobacco” seven times in The Sioux: The Dakota and Lakota Nations (Malden, MA and Oxford, UK: Blackwell Publishing, 2003). Gibbon notes the archaeological sites around Mille Lacs Lake in east-central Minnesota as yielding a variety of botanics, or plant remains, including locally cultivated tobacco. A cultural and socio-religious story concerning tobacco in the Lakota historical record comes in the form of “The White Buffalo Calf Woman,” a story set down by Black Elk, an Oglala wicasa wakan (“holy man”) and Catholic catechist. In 1931 and in the late 1940s, Black Elk embraced a hybridized version of Euro-American Christianity and Native ways, and he narrated a story where “the sacred messenger of the Great Spirit, brings the People the peace pipe, tobacco, and seven rites.” Students of American literature have considered this story for quite some time, and as Gibbon also notes, “A popular current trend is to devalue Black Elk’s teachings because they seem compromised by Christianity.” (Gibbon, 2003: 149) Whether it is used in customs on behalf of old and new ways, the role of tobacco remains central throughout Native America. “…For Tobacco being a common herbe, which (though vnder diuers names) growes almost euery where, was first found out by some of the barbarous Indians, to be a Preseruative, or Antidot against the Pockes, a filthy disease, whereunto these barbaous people are (as all men know) very much subject, through the intemperate heate of their Climat: so that as from them was first brought into Christendome, that most detestable disease, so from them likewise was brought this vse of Tobacco, as a stinking and vnsavourie Antidot, for so corrupted and execrable a Maladie, the stinking Suffumigation whereof they yet vse against that diesease, making son one canker or venime to eate out another. And this goes on for some length. Don’t smoke cigarettes, kids, because yes, they do stink, they are unhealthy for you, and they no doubt will cause and/or contribute to cancer. Yet also remember that not every culture uses or has used tobacco the same way, individually and throughout history. Every cultural historical perception toward tobacco is always in flux. And also there is a difference between cigarettes and leaf tobacco: the former are jammed with additives (even with fiber glass, they tell me!) while the latter is not.